I interviewed Egyptian Hip Hop the other night,and happily, they proved to be thoughtful, intelligent and as excruciatingly talented as they were excruciatingly young. Youth isn’t everything, I kept repeating to myself, as I sobbed all the way home. The Martial Arts aren’t young by Egyptian Hip Hop standards. But then again, who is? True, they stretch the definition of ‘New Band’ somewhat, having been knocking around for a couple years, but when another band strides forth from Glasgow, that hotbed of youthful, tuneful, jangly musical talent, it’s wise to listen. The Martial Arts arrive clutching melodies that are dizzyingly contorted and satisfyingly sweet – a bit like a giant Indie Curly-Wurly. Don’t Want To Talk is insistent, rousing and yes – youthful: brimming with young confidence, it takes a melancholy subject matter and spins it into a sweet shanty, Liverpudlian, simple and true. Here is 2’30” of exemption from age, real life, or any other concerns. The Martial Arts‘ trick is to provide respite from a world addicted to youth by using their nagging, charming songs to pull their listeners right back to the younger days. Like, weird, man. Lovely. Posted on February 8, 2010 by Joe Sparrow. 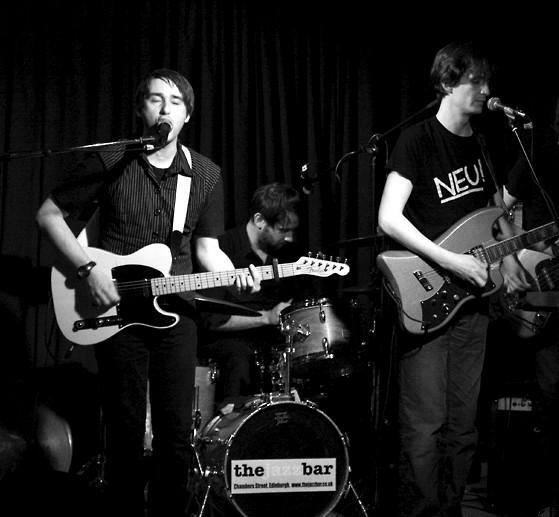 This entry was posted in Headline, Today's New Band and tagged glasgow, jangle. Bookmark the permalink.